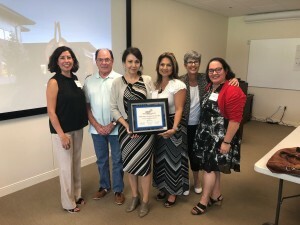 On September 10, 2018 Menninger, one of the nation’s premier mental health care systems, announced that for the third consecutive year it is funding social and emotional learning programs in Houston-area schools to enhance the health, well-being and academic success of vulnerable middle and high school students. With a $960,000 total investment for the 2018-19 academic year, BridgeUp at Menninger is supporting nine local organizations that are implementing innovative social and emotional learning programs that will impact nearly 8,000 students. 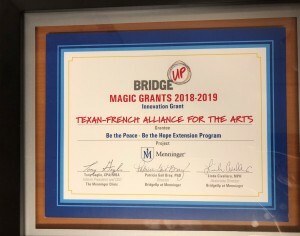 BridgeUp at Menninger is funded by a $8.9 million grant from the David and Helen Gurley Brown Trust. After a competitive selection process, Be the Peace Be the Hope Alliance program with Las Americas Middle School received a BridgeUp Innovation Magic Grant from The Menninger Clinic, one of the nation’s top psychiatric hospitals and a leader in mental health care. With their support we will detect mental and behavioral issues in at-risk youth and prevent disengagement, delinquency, bullying and on-campus violence. As a year long pilot program, Be the Peace Be the Hope will serve 50 extremely vulnerable youths at Las Americas Middle School and engage them through therapeutic arts to explore strengths, healtrauma and regain hope. The core curriculum for all of the BridgeUp at Menninger programs is the evidence-based Collaborative for Academic, Social and Emotional Learning (CASEL) framework, but each grantee identifies and tailors the program delivery method for its student population. The delivery methods range from performance art and visual art to peer mentoring and workshop-style lessons. By integrating the CASEL framework into their innovative programming, the grantees are enhancing students’ social and emotional competencies and classroom behavior; improving attachment and attitudes toward school; decreasing rates of violence, aggression, disciplinary referrals and substance abuse; and improving academic performance. The BridgeUp at Menninger model also requires that grantees implement a multi-tiered system of interventions that connects students with appropriate mental health supports such as screenings, counseling, peer-support groups, outpatient therapy or intensive psychiatric treatment. The grantees have the option to refer their students to Menninger for assessment and treatment. A third component of the BridgeUp at Menninger model is participation in an impact network that is facilitated by the All Kids Alliance to foster collaboration and short-cycle continuous improvement. Through this network, which meets four times throughout the school year, grantees have the opportunity to learn best practices from each other, discuss challenges and adjust their programming during the school-year. “This collaboration is a critical component to ensuring that BridgeUp at Menninger produces measurable outcomes and becomes a sustainable, scalable and replicable model that school districts, nonprofits and community health organizations from across the country can eventually implement to address the social and emotional needs of their students,” added Bray. For 29 consecutive years, The Menninger Clinic has been named a national Best Hospital in psychiatry by U.S. News & World Report in its annual survey of psychiatrists nationwide. Menninger’s mental health care system has become known for its expert team-based diagnostic assessments and treatment during its 93-year history. Innovative, personalized treatment approaches at Menninger continue to increase value for Texans and people nationwide to access the care that best meets their needs. Menninger is a private teaching hospital of Baylor College of Medicine’s Menninger Department of Psychiatry & Behavioral Sciences, and is a member institution in the Texas Medical Center.